MetalRockNews: AC/DC's Brian Johnson: "I had no choice but to stop performing on stage"
AC/DC's Brian Johnson: "I had no choice but to stop performing on stage"
AC/DC singer Brian Johnson has released a statement explaining his recent battle with hearing loss and clarifying the circumstances behind his inability to complete band's world tour. 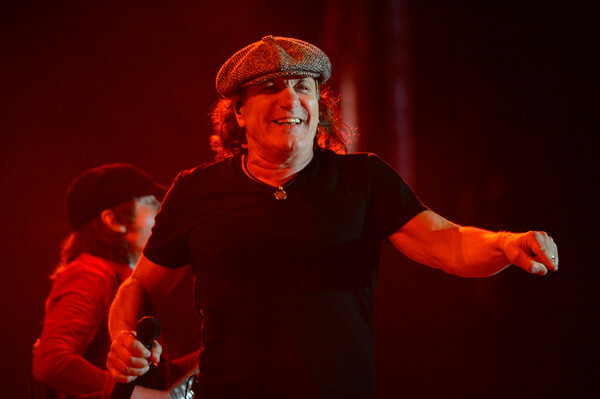 Johnson's statement said: "As many AC/DC fans know, the remaining shows for the 2016 AC/DC 'Rock Or Bust' world tour, including 10 postponed U.S. shows, are being rescheduled with a guest singer. I want personally to explain the reason because I don't believe the earlier press releases sufficiently set out what I wanted to say to our fans or the way in which I thought it should be presented. On March 7th, after a series of examinations by leading physicians in the field of hearing loss, I was advised that if I continue to perform at large venues, I risked total deafness. While I was horrified at the reality of the news that day, I had for a time become aware that my partial hearing loss was beginning to interfere with my performance on stage. I was having difficulty hearing the guitars on stage and because I was not able to hear the other musicians clearly, I feared the quality of my performance could be compromised. In all honesty, this was something I could not in good conscience allow. Our fans deserve my performance to be at the highest level, and if for any reason I can't deliver that level of performance, I will not disappoint our fans or embarrass the other members of AC/DC. I am not a quitter and I like to finish what I start. Nevertheless, the doctors made it clear to me and my bandmates that I had no choice but to stop performing on stage for the remaining shows and possibly beyond. That was the darkest day of my professional life. Since that day, I have had several consultations with my doctors and it appears that, for the near future, I will be unable to perform on stage at arena- and stadium-size venues where the sound levels are beyond my current tolerance, without the risk of substantial hearing loss and possibly total deafness. Until that time, I tried as best as I could to continue despite the pain and hearing loss but it all became too much to bear and too much to risk. I am personally crushed by this development more than anyone could ever imagine. The emotional experience I feel now is worse than anything I have ever in my life felt before. Being part of AC/DC, making records and performing for the millions of devoted fans this past 36 years has been my life's work. I cannot imagine going forward without being part of that, but for now I have no choice. The one thing for certain is that I will always be with AC/DC at every show in spirit, if not in person. Most importantly, I feel terrible having to disappoint the fans who bought tickets for the canceled shows and who have steadfastly supported me and AC/DC these many years. Words cannot express my deep gratitude and heartfelt thanks not just for the recent outpouring to me personally of kind words and good wishes, but also for the years of loyal support of AC/DC. My thanks also go to Angus and Cliff for their support. Finally, I wish to assure our fans that I am not retiring. My doctors have told me that I can continue to record in studios and I intend to do that. For the moment, my entire focus is to continue medical treatment to improve my hearing. I am hoping that in time my hearing will improve and allow me to return to live concert performances. While the outcome is uncertain, my attitude is optimistic. Only time will tell. Once again, my sincere best wishes and thanks to everyone for their support and understanding.